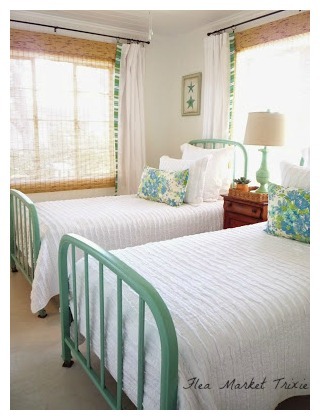 Today I would like to share one of our bedrooms at the cottage. The room itself is rather small, so we had our limitations for sure. I found a pair of vintage metal beds at an estate sale for 70.00.
great shape, I just painted them a pretty jade green. I made the floral pillows from a vintage curtain panels my cousin had. I love love love the fabric on them. 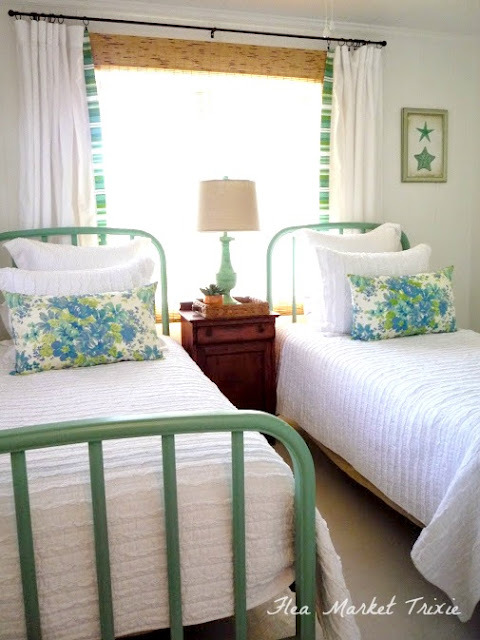 I couldn't find the right prints for this room so I made the starfish prints using vintage images. I think they fit in perfect. When you can't find the right curtains, why not make them? 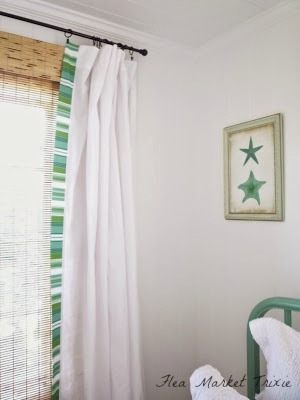 I've used this trick for years, make your simple curtains out of flat sheets. I love how this room turned out. This is our second time using butcher block countertops in a kitchen remodel. 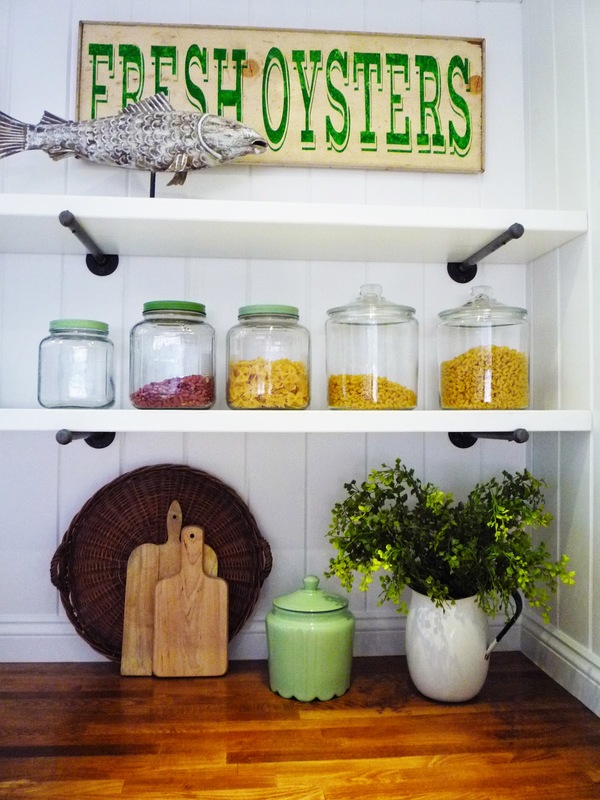 There are several reasons why I love them, they're affordable, easy to install and look great. 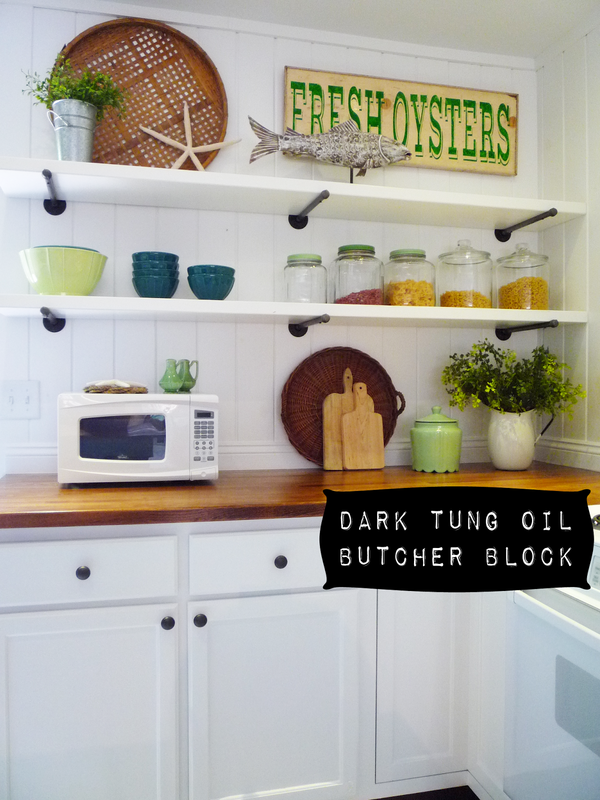 We tried using as many green products as we could, so in this kitchen remodel I wanted to use all natural tung oil. There are many tung oil products out there but only a few are pure tung oil. 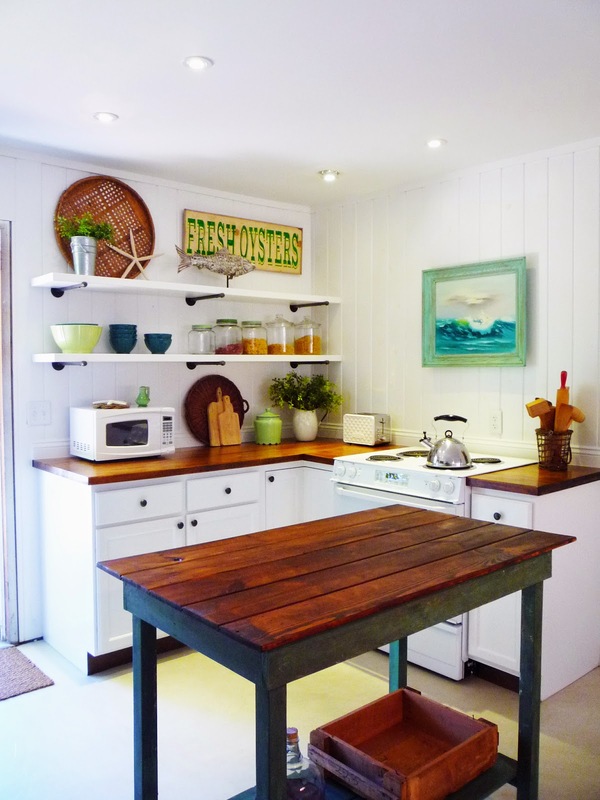 I found a dark tung oil from the Real Milk Paint Company which adds a rich beautiful patina. They also sell many other environmentally friendly products including paint. 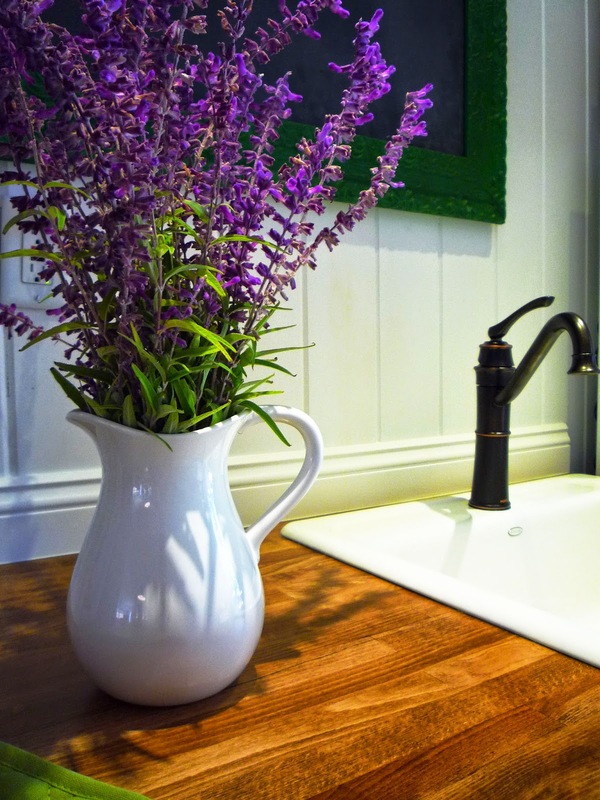 Real pure tung oil is non-toxic so it's a great choice for a countertops, however most people recommend thinning pure tung oil with mineral spirits, turpentine or naphtha. If you add these solvents to thin the tung oil it is no longer non-toxic. 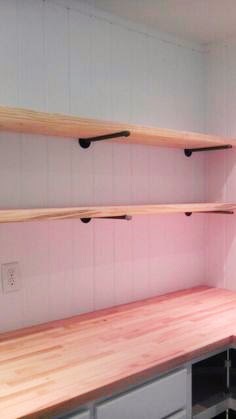 The Real Milk Paint Company has a great solution for this, they recommend and sell a citrus solvent to mix with tung oil, which allows it to remain non-toxic. This was really important to me. Let me tell you it was so easy to apply. I followed their applications instructions on the bottle, and also found tips and suggestions on their website. 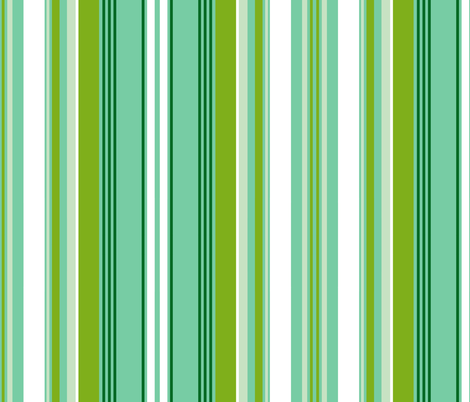 trust me I'll be using this stuff again on other projects.